5) Macromolecule adhesive made by SK Korea, more than 90 degrees. 7) Macromolecule adhesive made by SK Korea, more than 90 degrees. offices, banks, hotels, restaurants, and apartments . 2). Other kinds of buildings: as ideal decorative materials for the outer-wall and inner-wall of buildings. 3). Kitchen cabinets, billboards, signboards, tunnels and subway interiors. 4). Ceilings, eaves, balconies, partitions and interior decorations. 5). Telephone booths, vehicle bodies, and industrial usages. 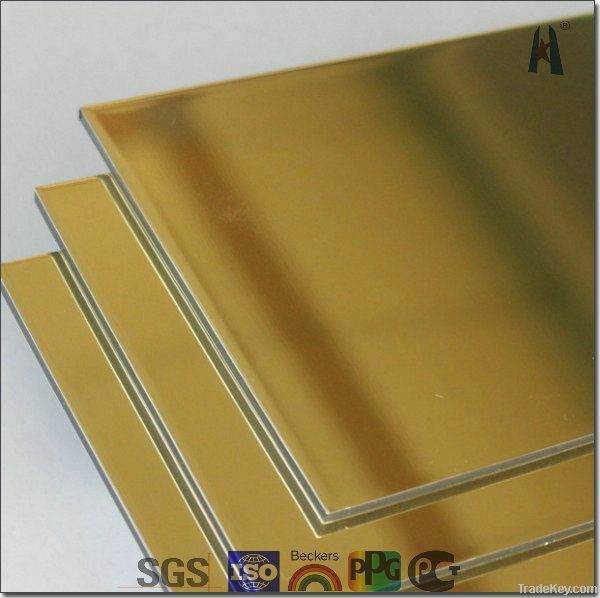 1)Under natural climate ,film coating will be no flake .no rubbles ,no vestige and no pulverization. 2)Under common environment.no flake.no rubbles. 3)Under common temperatures and radiation,no color deferent. 4)According to international test standard,all the tested items are satisfied with high-class. 5)Our products with PVDF coating which produced under GB/T17748-2008 is with 70% PVDF.and under common environment,we can guarantee 15~20 years;and for FR products,it is good at fireproof,and the FR grade is A2 ,B1(according to the standard Q B8624). (These are base on some normal dimensions ,the actual quantity should according to your final dimensions ) . 1) 20 ft container: 2mm panel-6000M2, 3mm panel-5000M2, 4mm panel-4000M2, 5mm panel-3000M2. 2) 40 ft container:2mm panel-8000M2, 3mm panel-7000M2, 4mm panel-6000M2, 5mm panel-5000M2.